Cleveland Are You Ready For THE BOB ROSS EXPERIENCE FUNDRAISER? - sandwichjohnfilms Cleveland Are You Ready For THE BOB ROSS EXPERIENCE FUNDRAISER? Cleveland Are You Ready For THE BOB ROSS EXPERIENCE FUNDRAISER? Ready to have some fun? Let’s do it. 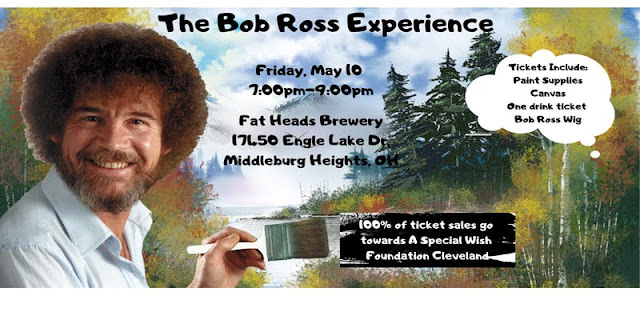 On Friday, May 10, Fat Head’s Brewery in Middleburg Heights will welcome The Bob Ross Experience, a paint night fundraiser with 100% of the proceeds going to A Special Wish Foundation, Cleveland chapter, a non-profit that grants wishes for children from birth up to 20 years of age with life-threatening diseases. Tickets to the Bob Ross Experience, taking place from 7:00 – 9:00PM, will be $45 plus a handling fee. Price includes paint supplies, a canvas, one drink ticket and, perhaps most importantly, a Bob Ross wig. “Honoring Bob Ross through this unique fundraiser is such a fun way to raise money to help grant wishes in our community,” said Eileen Lane, executive director of A Special Wish Foundation.